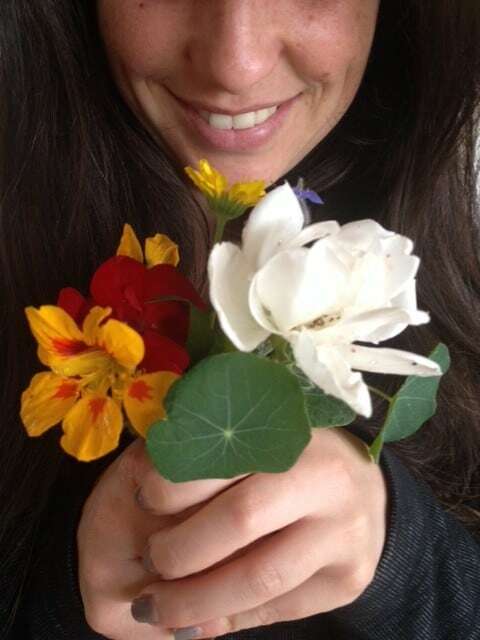 Mother’s Day might mean flowers, but we’re getting creative in the kitchen today with these beaut edible flowers straight from the garden (inspired by a hot tip from April Samson-Kelly)! We love eating all the bits of this plant but the edible flowers are possibly our favourite bit with their showy petals, spicy nip and sweet nectar-y goodness in their little tails. 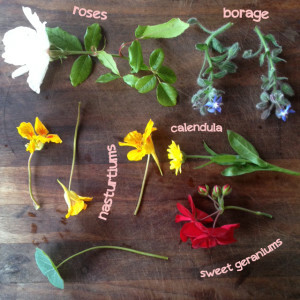 A lovely garden treat for kids, and excellent for tarting up a salad. Calendula flowers are another abundant source of pretty edible garden garnish action. Sprinkle the plucked petals over anything for a bright yellow spark of brilliance. Sweet geraniums smell incredible and come in a variety of “flavours”. Not all garden geraniums have edible flowers, so bone up with this handy guide before attempting an identification. We love the unique oyster-y flavours of borage flowers and leaves. Great in salad, suspended in ice-blocks or as a garnish for some gloriously green borage soup. They’ve got to be the most popular flower on a day like today, but roses are also very edible flowers (though we wouldn’t recommend those you get from a florist or commercial grower – they’re likely covered in pesticides!) They have so many uses and add beauty and fragrance to every dish they touch.